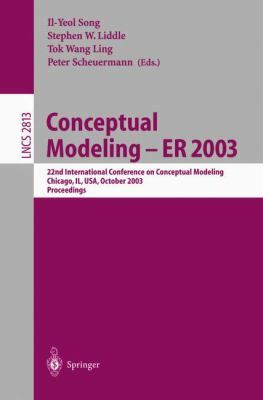 This book constitutes the refereed proceedings of the 22nd International Conference on Conceptual Modeling, ER 2003, held in Chicago, IL, USA in October 2003. The 38 revised full papers presented together with abstracts of 4 invited talks and 7 industrial presentations were carefully reviewed and selected from 153 submissions. The papers are organized in topical sections on systems and data integration; workflows, patterns, and ontologies; metamodeling and methodology; view and XQuery approaches; web application modeling and development; requirements and evolution; data warehousing and OLAP; conceptual modeling foundations; data mining; innovative approaches; queries; and schema and ontology integration.Song, Il-Yeol is the author of 'Conceptual Modeling-ER 2003 22nd International Conference on Conceptual Modeling, Chicago, IL, USA, October 2003 Proceedings' with ISBN 9783540202998 and ISBN 3540202994. Loading marketplace prices 70 copies from $6.86 How does the rental process work?